In recent years, tourist flow from Azerbaijan to neighboring countries continues to grow. Thus, between January and July of this year, over 2.5 million citizens of Azerbaijan visited foreign countries, which is 9 percent more compared to the same period of last year, the State Statistics Committee reported. Within this time period, Georgia, with 33.4 percent, took a leading place as a tourist destination for Azerbaijanis among neighboring countries. Also, 24 percent of visitors travelled to Iran, 22.9 percent - to Russia, 15.2 percent - to Turkey, 1.4 percent - to Ukraine, 1 percent - to the UAE, while 2.1 percent of people preferred to visit other countries. Moreover, according to the data, men (67.9 percent) are traveling significantly more than females (32.1 percent). Meanwhile, the number of Azerbaijani citizens visiting Iran increased by 31.2 percent, Georgia - by 0.9 percent, Turkey - by 5.5 percent, and Russia - by 2.6 percent. Rail and road transportation was the dominant among 79.9 percent passengers, air and sea transportation use accounted for 19.2 percent. Recently, Head of Georgia’s National Tourism Administration Giorgi Chogovadze said that 1.6 tourists from Azerbaijan visited Georgia in 2017. 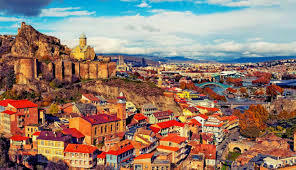 An increase of 11.2 percent was observed in the number of tourists coming to Georgia from Azerbaijan. When Azerbaijani population to reach 10mln?